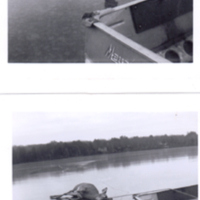 My Dad was a true sportsman who supported our family during hard times by trapping and hunting in the Stone Lake, Wisconsin area. One day during deer hunting season, he and I were having lunch together in our home on Big Sissabagama Lake when he looked out the window and saw something on the ice about 3/4 mile across the lake. He looked with his binoculars and coud see it was a large deer lying on the ice. He felt that either it had fallen and couldn’t get up, or it was wounded and dying out there. We decided to go down to the south end of the lake to see what we might be able to do to help it. In case we needed it, Dad put a light weight aluminum boat into the back of the pick-up. We drove around the lake to see where we could get to the deer. The ice was only about 2 inches thick, so we were concerned about walking onto the ice without something to hang on to, in case we broke through. We dragged the boat down to the bank on a point of land that got us fairly close to the deer. I got into the front of the boat, and Dad pushed the boat out onto the ice. The doe did not make any attempt to stand up on the ice, she just laid there and watched as we approached her. I’m sure she was very frightened, but was unable to get up and run. We had a rope rigged up that would not tighten and choke her as we pulled her. It would also allow her to get loose when she got to shore and had sure footing under her. I was in the front of the boat as my father pushed me up close enough to get the rope around her neck. Surprisingly, she never struggled or tried to get up and get away from the approaching boat and humans. She allowed me to gently and quietly slip the rope over her head and around her neck. As soon as I had the rope secure around her neck, Dad started pulling the boat and me to shore. She seemed to realize that we were there to help her, and she laid her head down on the ice as we pulled her closer to shore. When we were about 30 yards from shore, I gave Dad the rope. He continued to pull her slowly to shore, hoping that when she got to land, she would get up and have her freedom. 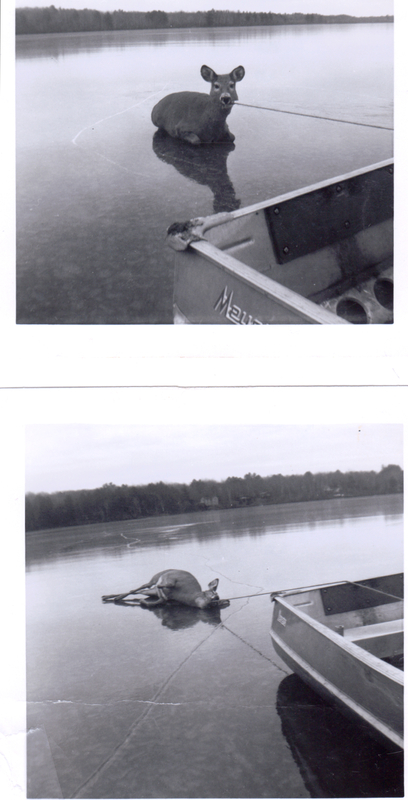 At this point, I got out of the boat on the ice to help Dad with the doe. We took the rope off, and pulled her onto the bank by her ears. There was much disappointment when we got her onto the shore. She made a couple of valiant leaps up the bank, but could not go any further. We realized that when she went out onto the ice, she must have slipped and sprawled, splitting her hind quarters. She never would have been able to walk. It was very sad, but there was nothing we could do to help her any further. We had to leave her lying there on the leaves, as this was buck season only, so we had no legal right to kill her. We went back to the house and called the Dept. of Natural Resources. They said they would come and dispose of her that evening to put her out of her misery. My Dad always felt we should have done the humane thing and disposed of her ourselves earlier in the day, but it was illegal to do so. Crotteau, Carolyn Skille , “Sad fate of a beautiful doe,” Recollection Wisconsin, accessed April 25, 2019, http://recollectionwi.org/items/show/9.